From top to bottom: Our rust bow is the softest of velvet, simple but so stunning. Next we have a pretty brown and blue floral bow perfect for denim days. 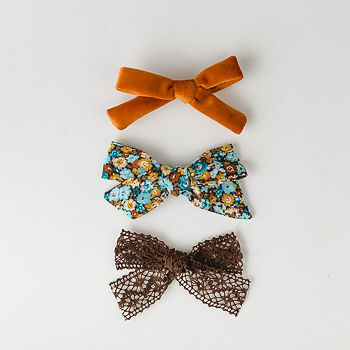 Last we have a brown lace that is the cutest of bows. Our Rust pack is delivered in a beautiful pink box, perfect for a princess with a styling card to show what to wear with your new pretty bows. Gift message options are available at checkout.